Because of continuous monitoring of all your system activities in granular level for implementing Default-Deny Protection, Comodo Internet Security generates pop-up alerts whenever it identifies any event appearing to be a malicious activity or execution of programs that require privileges like internet access and file access rights. Each alert provides information and options that enable you to make an informed decision on whether you want to allow or block a request or activity. Alerts also allow you to instruct Comodo Internet Security on how it should behave in future when it encounters activities of the same type. But at times when you are involved in activities like playing computer games, where you do not want to be interfered with such alerts, you can temporarily stop them from being displayed, require undisturbed environment. During this time, operations that can interfere with users' gaming experience are either suppressed or postponed. Right-click on the CIS System Tray icon. Select 'Game Mode' from the options. The alerts are now suppressed. 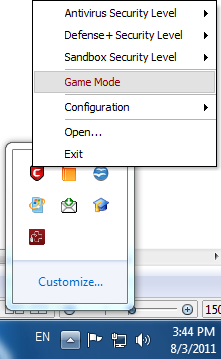 To resume alerts and scheduled scans, just de-activate 'Game Mode' from the right click options.